Gum disease affects most people at some time during their life. It is usually caused by a build-up of plaque and Tartar (Calculus) on teeth. 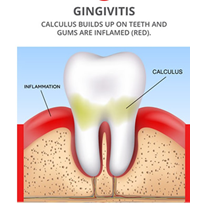 Gingivitis is an early gum disease and occurs when dental plaque and calculus builds up on teeth, particularly where the gum joins the tooth. causing further inflammation (redness and swelling). 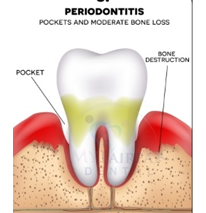 Periodontitis can affect the covering of the tooth root which is called Cementum, the jaw bone and the fibres that connect the tooth to the bone (periodontal ligament). As the disease progresses and bone is lost, larger spaces begin to form between the tooth and the gum, then the tooth will lose its attachments to the bone, become mobile and eventually will be lost ( Fall by itself inside the mouth or the Dentist will take it out ). Like many conditions, early intervention to treat gum diseases can ensure the longevity of your teeth. If you have swollen or bleeding gums or your teeth feel loose, you should visit us ASAP to diagnose the case and talk about treatment options. Dr Yousif will examine your gums with a probe to measure the spaces between the tooth and gum. This will determine the health of your gums and supporting structures. Then he will instruct you in tooth cleaning techniques or may clean your teeth professionally to remove any plaque and calculus (hardened plaque). Some times with cases of Periodontitis and bone lost, you might be in need for what is called “ Deep Cleaning”, Dr Yousif can provide you with this service under local anaesthetics, But in advanced cases , he will recommend you to see a Periodontist who might perform an Open Gum Surgery to do a very deep cleaning of your teeth…. Copyright © 2018 Bright Dental care. All Rights Reserved.